Wheaton Braces are clinically proven to be an effective primary treatment for metatarsus adductus (MTA), congenital clubfoot (CTEV), and tibial torsion. Three-point fixation is the secret. The first fixation point extends the brace beyond the toes to correct any associated hallus varus. At the second fixation point, the hindfoot is securely held. The third fixation point is where a hook-and-loop strap is tightened against the apex of the deformity. Soft, padded lining helps prevent skin breakdown. The physician can change the position of the strap, and the direction and degree of corrective force for customized direction. 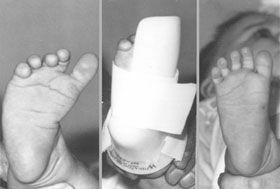 The TEV-CRB Wheaton Brace (AFO) addresses all three aspects of congenital clubfoot:forefoot adductus-varus, hindfoot varus, and ankle equines. TEV-CRB brace helps correct forefoot adductus-varus using three-point fixation principle and sets ankle at 90 degrees (neutra), which is necessary to help prevent Achilles tendon contractures in children who have begun walking. Alleviates hindfoot varus by holding heel securely in a neutral position. Use day or night to maintain correction after casting or surgery for clubfoot. Made of foam-lined plastic and ar not to be used for ambulation. Telescoping Brace (KAFO) replaces Denis-Browne Bar for treatment of tibial torsion and associated congenital clubfoot in children up to four years old. 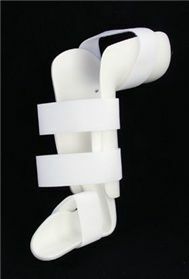 Telescoping Brace is placed only on affected leg and consists ofTEV-CRB Wheaton Brace and separate Knee Orthosis (KO). KO encloses back of knee, capturing tibia and femur and holds knee at 90 degrees flexion, separating any rotational force on tibia from femur or hip. KO "telescopes" over TEV-CRB at tibia, allowing brace adjustment for growth in tibia length. Hook-and-loop fasteners for adjustment and readjustment of leg-length growth and desired rotational force on tibia. Complete fitting instructions included. Adjust components with heat gun or heavy-duty scissors.